Rubbish and recycling must be sorted and put into standard-issue bags. The easiest place to buy the bags is your local supermarket. 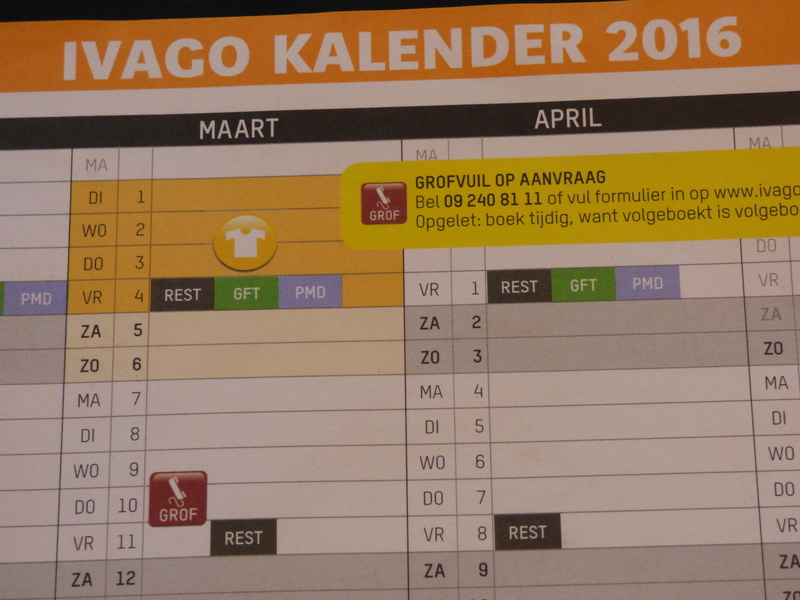 However you won’t find them on the shelves; you’ll need to ask for them (‘afvalzakken‘) when you are at the checkout. The prices of the bags are set by law, so don’t waste your time hunting around for a better deal. Yellow bags (which your general waste will go in) come in two sizes – Small (30 litres) and Large (60 litres) and are sold in rolls of 10. They are 88 cents per bag for the small ones and €1.75 for the large ones. 75 litre blue bags (for PMD – see below) cost 24 cents each. The incentive of course is to fill up the cheaper blue bags with recycling and not create so much general waste in the more expensive yellow bags. When you move into your house/apartment, you should find a yearly paper calendar already there or perhaps in your post box. If not you can also see it online here. The calendar tells you what kind of rubbish or recycling will be collected on which day in your street, as it differs throughout the city. REST: short for ‘restafval’. General waste in yellow bags. Every week. PMD: Plastic (including shampoo/shower gel bottles), Metal (i.e. drink cans and aluminium tins) and Drink (i.e. juice cartons) in blue bags. Every other week. PAPIER: Paper and card, in a cardboard box (which will be taken too). Every month. 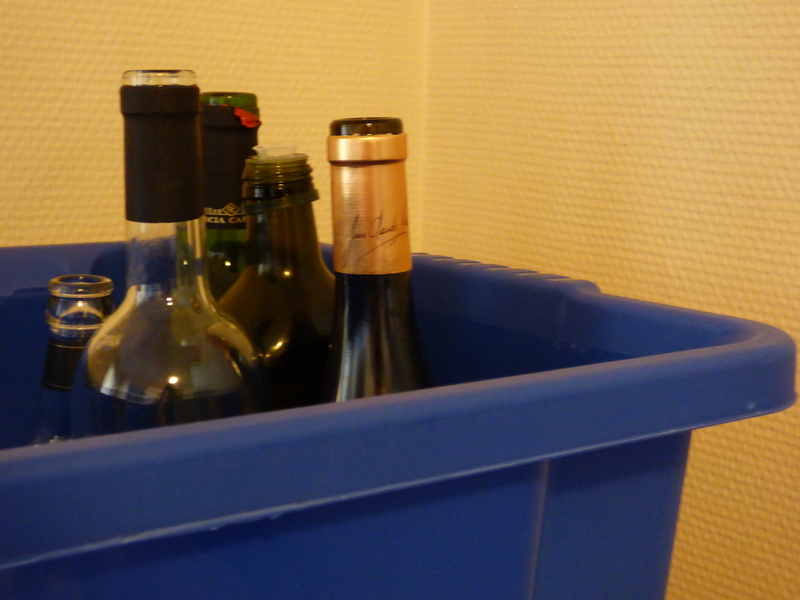 GLAS: Glass, in a plastic box/bucket (which will be emptied and left on your doorstep). Every month. Stuff to be collected can be put outside from 7pm the night before collection. If you continue to break this rule, you’ll get notes through your letterbox. Empty glass containers and remove their lids/caps before leaving these outside your house for collection. If you don’t do this they will not be collected and you’ll get a note stuck to it. Remember to check beer bottles first in case they’re worth something. When y ou buy most beers from a supermarket or retailer in Belgium, you’ll pay an extra 10 cents or so for the bottle. When you take the empties back, you’ll get this money back. So check to see if there is a value (“0,10€)” written on the label before you chuck. And unlike in Germany, you don’t get any money back for cans and plastic bottles. Glass collection from your house requires you to put your empties in a plastic box (not cardboard) rather than just standing them individually on your doorstep. Because the collectors will leave the box behind, these boxes can go missing before you get home for the day. So don’t spend too much money on the box, and write your house number and street name on the side. You can also take pretty much anything you want to get rid of to one of Ghent’s waste disposal parks. The main one is on Proeftuinstraat, slightly outside of the city centre. But you can’t just show up – you will first need to apply for a card in order to access the sites. You can do this online (Dutch only), but only if you have a registered (domicilie) address in Ghent, and a Belgian registration number. The card is free but requires a €7.50 deposit. Your card will be sent to you through the post, and entitles you to 12 free visits per calendar year. The calendar in your house/apartment will tell you when the parks are closed. Large items that you can’t manage to take to the dump yourself can be collected by a Kringloopwinkel. These are the charity shops in Belgium. You may spot large (often green) containers by the side of the road with ‘Textiel’ written on the side. These are places where you can dispose of unwanted clothing, shoes and fabrics. 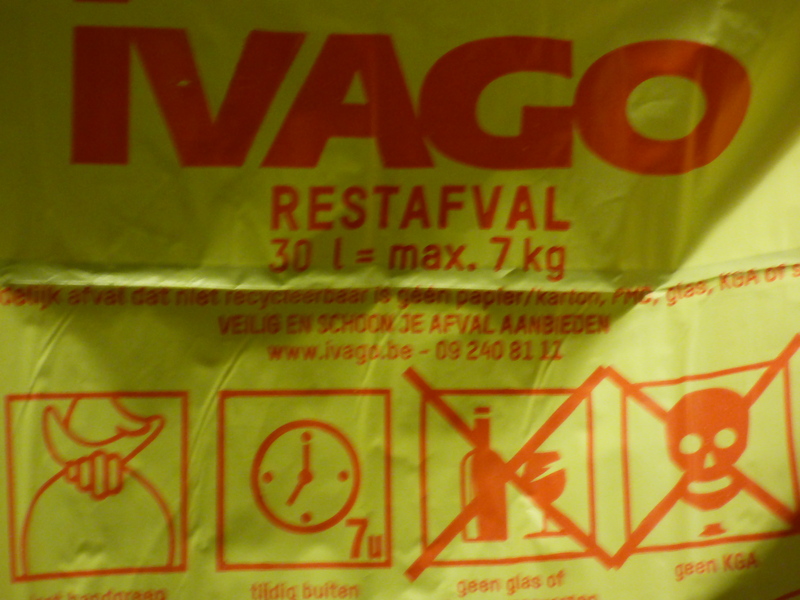 Ivago will also come and collect food and garden waste as well as larger metal and combustible items from your house if you want, but it is not compulsory. Get in touch with Ivago to arrange how to do this. Illegal dumping of waste can result in a fine of €250 plus whatever costs Ivago choose to add (up to €250) for them to clear it up.